Terroir: Situated 125 miles south of Paris, the Sancerre landscape undulates at an altitude between 650 and 1,300 feet. The Loire River on the Eastern side of the hilly environment creates a relatively temperate microclimate for the wines. 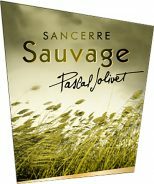 Sauvage Sancerre Blanc is made from 100% Sauvignon Blanc grapes, whose selected parcels in Champtin are planted in limestone soils. Vinification: 100% organically cultured, the Sauvage Sancerre Blanc grapes are fermented naturally, without the addition of yeasts. After 12 months of maturing on the lees, the wine is bottled without filtration or cooling. As a vibrant aperitif or to accompany chilled shellfish like lobster or crayfish, grilled fresh-water fish such as pike or trout, swordfish, sea bass or salmon, or white meat and poultry, Sauvage Sancerre Blanc is an ideal choice.